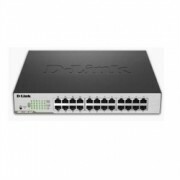 Search hundreds of online stores that deliver to Sydney, Brisbane, Melbourne, Canberra, Perth, and all over Australia and find the best offers for D-Link DGS-1024D switch (Without management, 1,000 MB/s transfer rate, 24 10/100 Mbps ports). Only on ShopMania you can find the lowest D-Link DGS-1024D prices available, learn about the latest discounts and compare switches deals. Here you can browse through the D-Link DGS-1024D photo gallery, find out all about its features and specs and read the product reviews and user comments from our community.